This entry was posted in 387 Short Stories and tagged 387 short stories, short stories on October 30, 2014 by thehungryreader. Today was Day 319 of the 387 Short Story Project. I read a unique story, written by a unique writer. I had not heard of him earlier and I am glad that I did now. 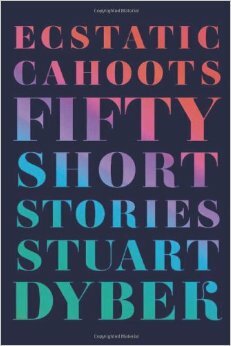 Stuart Dyber is a writer who is full of empathy and wit at the same time. “Inland Sea” is a story which is short and extremely short at that. At the same time, the story could be about anything. That is what I love about it. The story just describes a scene and it is left to the reader to interpret the plot. Do read it. You will be marveled by it. This entry was posted in 387 Short Stories and tagged 387 short stories, Day 319, Inland Sea, Stuart Dyber on October 24, 2014 by thehungryreader. There are a lot of authors who write about animals and humans, but I doubt if any of them write as well as Kate DiCamillo does on the topic. I was first introduced to her when I read, “Flora and Ulysses” and since then I have not turned back. Kate DiCamillo’s stories are heart-warming and each of them features an animal and then the love between humans and animals is most visible. 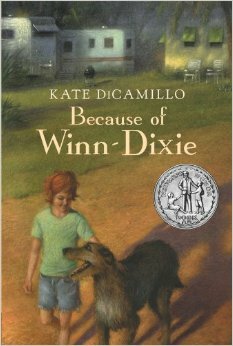 “Because of Winn-Dixie” is a book about a girl and her chance meeting with a dog that changes everything in her life and in the new town she and her father move to. Ten-year old Opal learns 10 things about her long gone mother from her preacher father. That happens because of Winn-Dixie, the dog she finds at a departmental store and things are then never the same. I love DiCamillo’s writing. There is of course the simplicity, which is needed for a children’s book but her books are also accessible to adults, when it comes to emotions and feelings. This book made me want to watch the movie. DiCamillo packs so much in less than two hundred pages and with every turn of the page, you either smile or choke up or both. If you want to start reading children’s books, I strongly recommend you read Kate DiCamillo. This entry was posted in Animals, Books, children's fiction, Review, Walker Books and tagged animals, Because of Winn-Dixie, Books, Dog, Kate DiCamillo, Review, Walker Books on October 24, 2014 by thehungryreader. This entry was posted in 387 Short Stories and tagged 387 short stories, short stories on October 23, 2014 by thehungryreader. It is a small book. It is something that you will perhaps read in half an hour. It is the kind of book though that will remain in your subconscious forever. It is an essay. 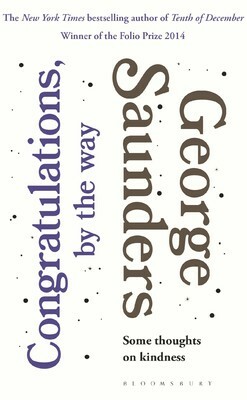 It is a Commencement speech given by George Saunders at Syracuse University in May 2013. The speech is about kindness, about what it means to be kind and perhaps the only regrets he has ever had have been those when he was not kind to people. “Congratulations, By the Way” is a book which will make you reflect and wonder about life and its worth. The book does not proclaim to teach you anything and maybe if you want to, you will probably not learn anything from it either. But I also think that kindness is something which is inherent, and yet most of us fail miserably, at being kind. The book is simply written and is just about being kind to one another and if possible, also to oneself. We also tend to forget sometimes how important it is to be kind to oneself. I will most certainly reread this book and also will recommend it to people – so that we never forget to be kind. This entry was posted in Bloomsbury Publishing, Books, Non Fiction, Review and tagged bloomsbury, Congratulations by the Way, George Saunders, Kindness, Speech on October 15, 2014 by thehungryreader.